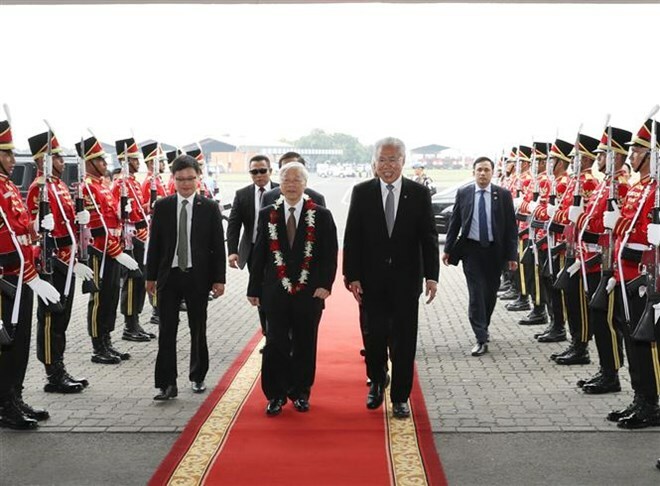 Jakarta (VNA) – Party General Secretary Nguyen Phu Trong arrived at the Soekarno-Hatta airport in Jakarta on August 22, beginning a three-day official visit to Indonesia at the invitation of President Joko Widodo. The Party leader was welcomed at the airport by Indonesian Minister of Commerce Engatiato Lukita, Co-Chair of the Indonesia-Vietnam Joint Committee on economic, science, technology cooperation and other Indonesian officials, as well as Vietnamese Ambassador to Indonesia Hoang Anh Tuan, among others. This is the first visit of a General Secretary of the Communist Party of Vietnam to Indonesia, and the first made by a senior leader of Vietnam since the two countries set up their strategic partnership in June 2013. Vietnam is the only ASEAN country Indonesia has a strategic partnership with. In recent years, two-way trade has grown well. Import-export turnover increased from 4.6 billion USD in 2012 to 5.6 billion USD in 2016 with average growth of 5 percent. The two countries are striving for 10 billion USD in bilateral trade by 2018. As of April, Indonesia ranked fifth in ASEAN and 30th among the 105 nations and territories investing in Vietnam, with 59 projects, mainly in oil and gas exploration and exploitation, coal mining, banking and timber processing. Vietnam has invested in seven projects involving mining, retailing, repair and communication in Indonesia.